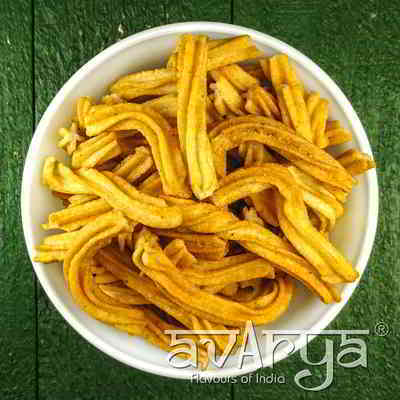 These tasty Soya sticks from Avarya are a nutritious accompaniment to your tea! Rich in proteins, vitamins and minerals, they are made from extremely nutritious ingredients. These sticks are a wonderful infusion of mouth-watering flavours and will give you a crunchy and a delectable taste, while stacking your daily protein consumption. 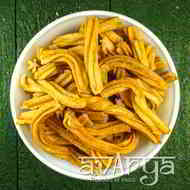 Soya Sticks	NK-ST-1321 These tasty Soya sticks from Avarya are a nutritious accompaniment to your tea! Rich in proteins, vitamins and minerals, they are made from extremely nutritious ingredients. These sticks are a wonderful infusion of mouth-watering flavours and will give you a crunchy and a delectable taste, while stacking your daily protein consumption. Udad Dal, Soya Flour, Starch, Iodized Salt, Ajma, Chilly Powder & Edible Veg Oil. The shelf life of Soya Sticks is 60 days.